« How to Pursue Truth – Camille Carlisle, M.S. Susan Kassman Sack received her PhD in Theology in 2014 from the University of Dayton after a career as professor of Math and Computer Science and as Systems Analyst. Her book, America’s Teilhard, which deals with the rise and fall of Teilhard’s popularity in the 1960s will be published by The Catholic University of America Press in spring, 2019. 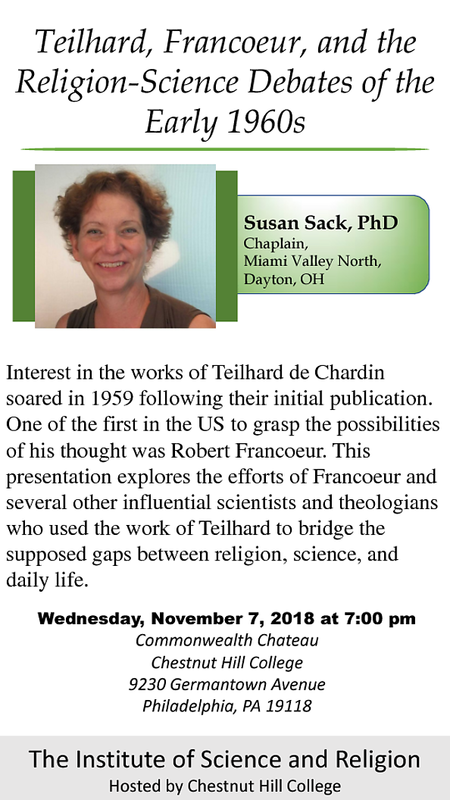 Sue presently serves as chaplain at Miami Valley North hospital in Dayton, Ohio and is pursuing certification as a spiritual director. Sue and her husband have been operating a small farm in southwestern Ohio for some three dozen years. Come join us at 7pm on November 7th! Free Will Donations are accepted and very much appreciated.